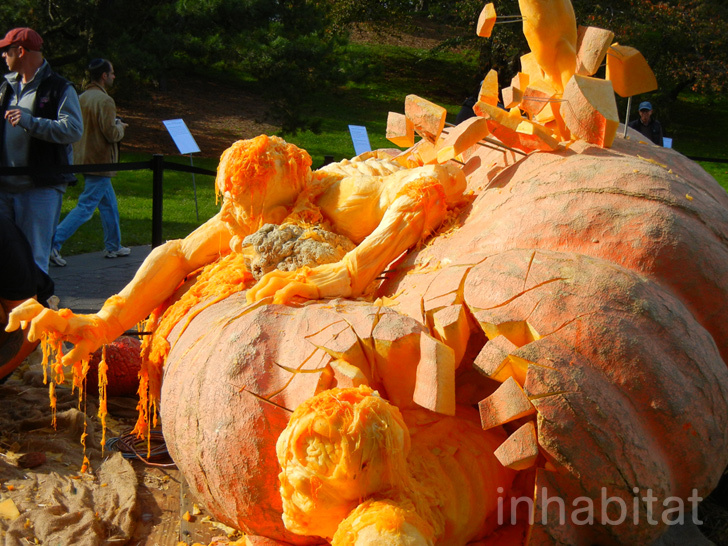 World's Largest Pumpkin Carved Into an Awesome Creepy Sculpture - Exclusive Photos! Think you make a mean jack-o-lantern? You’ve got nothing on professional carver Ray Villafane who transforms pumpkins of all shapes and sizes into intricate masterpieces. This weekend, Villafane took on the world’s largest pumpkin, a behemoth clocking in at 1818.5 pounds, at the New York Botanical Garden. We were on the scene as the carving master sliced and diced the pumpkin, creating a spine-tingling sculpture of zombies and demons draped in “guts” as they break out of the giant squash. Hit the jump to see our exclusive photos! Think you make a mean jack-o-lantern? You've got nothing on professional carver Ray Villafane who transforms pumpkins of all shapes and sizes into intricate masterpieces. This weekend, Villafane took on the world's largest pumpkin, a behemoth clocking in at 1818.5 pounds, at the New York Botanical Garden. We were on the scene as the carving master sliced and diced the pumpkin, creating a spine-tingling sculpture of zombies and demons draped in "guts" as they break out of the giant squash. Hit the jump to see our exclusive photos!